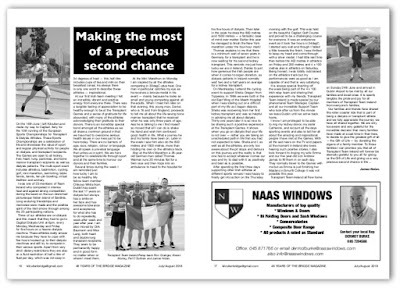 If you've ever wondered about the variety of people who compete internationally at the European Sports Championships for Transplant and Dialysis Athletes, James Nolan has an excellent spread in the summer Bridge about it, writes Brian Byrne. Recently returned from the latest championships in Cagliari, Italy, he writes about the 'incredibly vibrant and positive energy' he experiences at such events, and provides pen-pictures of fellow athletes from many other countries. He notes the 'roller coaster ride' that is part of being a transplant or dialysis athlete, and gives us a sense of the wide community of families and friends who make up the people who have been given 'a precious second chance' at life, or are waiting for it. Just one article in 40 pages of the latest issue of Kilcullen's community magazine, on sale for €2 in the usual shops and outlets.